Three environmentalists with the Florida Wildlife Corridor Expedition have wrapped up seven days trekking through Florida's urban midsection. 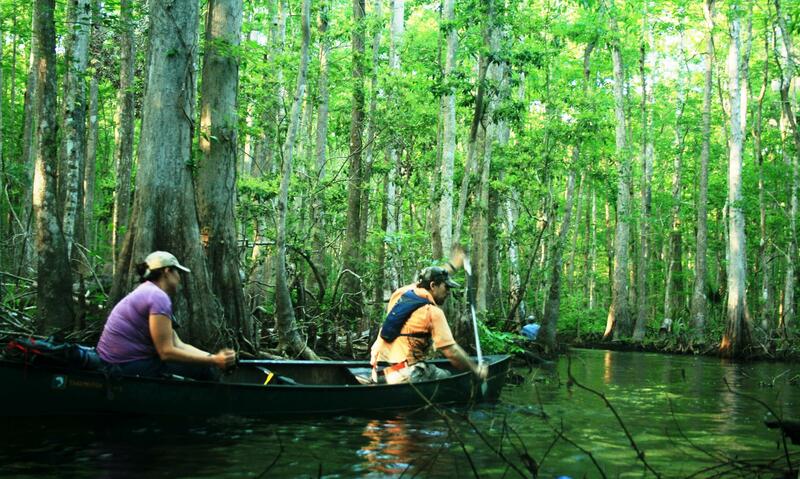 Their mission - paddle and hike through a narrow funnel of wild land to see how animals survive the journey. Sooner or later, any creature trying to migrate between the southern and northern halves of the state will run into the barrier known as Interstate 4. "We've got bobcat tracks right here," said expedition member and bear biologist Joe Guthrie, under a massive highway overpass. "Or it could be old, it's very muddy." Halfway through the week-long trip, Guthrie found animal footprints as Reedy Creek passes under I-4, just down the road from Disney World. He took a look with Florida panther biologist Jennifer Korn, who has set up a camera trap underneath the busy Interstate. Several feet above, a steady roar of thousands of cars is what animals trying to traverse this barrier here, night and day. Korn's camera traps and footprints show the traffic of wildlife that crosses in the shadow of the cacophony of automobiles. Korn says she's documented Florida panthers that have passed through here on their way north. Guthrie says for many animals, this is a passage of life and death. "An animal that's deep in the forest in one of these swamps may live 99 percent of its life away from the noises of man and then coming into proximity with the Interstate is just a wall of sound and vibration and speed it doesn't contemplate - it hasn't had to deal with ever in its life," he said. "And so a lot of them are going to die in that scenario, and especially if they're a young animal that's dispersing from its mother's home range outside its area where it's familiar, it's going to mess up, and get killed. It's really sad." Expedition members paddled and hiked from the Disney Wilderness Preserve at the headwaters of the Everglades, past the theme parks and into the Green Swamp, northeast of Tampa. 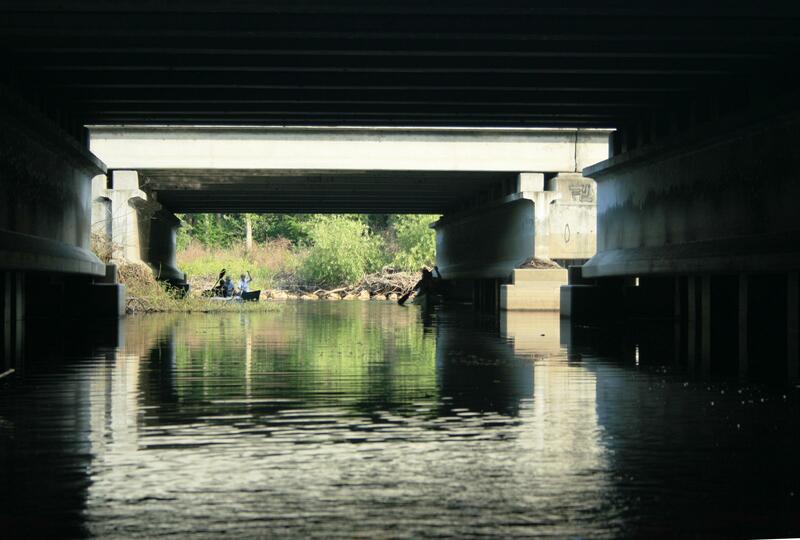 They stopped under I-4 to highlight the need for Interstate highway wildlife underpasses. This has been done on Alligator Alley and a newly-rebuilt stretch of I-4 between Orlando and Daytona Beach - as well as the new Wekiva Parkway near Orlando. They found parts of this trip to be a paradox. Undeveloped areas south of I-4 - some of which are only several hundred feet wide - proved nearly impenetrable. Every step yielded a slap in the face with a branch, a brush with poison ivy, or a step onto a cottonmouth snake. And Walt Disney World - which is responsible for much of the growth in the I-4 corridor since it opened in 1971 - is now the biggest holder of undeveloped land along Reedy Creek. Expedition leader Mallory Lykes Dimmitt of Tampa has been with these two men for the third trip since 2012. She says her biggest surprise was seeing the most wildlife on the trip - right in the middle of Disney. "It was so crazy because you could hear all of these noises we thought was construction was really the rides at (Disney's) Animal Kingdom," she said from atop a kayak in Reedy Creek, a couple of miles north of I-4. "So this background roar of all the theme park noises that was going on on one side, and you could hear the loudspeaker on the other side was the water park, we had our best nature scene of the trip so far in between those two things. Expedition member and wildlife photographer Carlton Ward Jr. said just a few miles separated an impenetrable swamp south of I-4 in Osceola County to where Reedy Creek essentially becomes a water hazard for golfers at Disney World. "To come from a wild experience, where we had sightings of otters, numerous wading birds, a barred owl sitting on a low-hanging branch of a cypress tree looking for amphibians in the water flowing below," he said, "and just a mile or two upstream, a golf course." Those golfers, he wonders, probably don't know that their water hazard flows all the way south to the Everglades. Ward described this corridor as where Florida's wild and developed worlds collide. "It's going to be the anti-wildlife corridor if we don't put steps in place to protect it. Because Interstate 4 is quickly becoming a dividing line - especially between Orlando and Tampa that could cut the Everglades system off between the rest of our state and the rest of our country," he said. One of the group's aims is to beef up Florida Forever, the state's main land-buying program. State lawmakers gave that exactly zero dollars the first seven years of Gov. Rick Scott's tenure. This year, $100 million was placed into the program to pay for conservation lands statewide. Some of that could go to the corridor. All this comes despite passage by the state's voters of a Constitutional amendment that mandated that three-quarters of the taxes collected on real estate transactions be used for conservation. This year, that would have yielded about $800 million. Ward calls it an investment in "green infrastructure." "The $100 million that's been allocated to Florida Forever is a great start. But by my rough estimations, we're losing three or four times as much land to development," he said. "The pace of loss is far outpacing what we can accomplish for conservation with the $100 million." And since the state spends about $10 billion a year on road its roads budget, he believes spending only 5 percent of that - $500 million - would give conservation a fighting chance in Florida. Their message is being heard, said Eric Draper, head of the state parks department and former executive director of Audubon of Florida. He spoke to the group during a stop at Lake Louisa State Park in Lake County, where the hilly Lake Wales Ridge descends ever so slightly into the Green Swamp. "Florida Wildlife Corridor has been very influential in Tallahassee," he said. "I think what the Florida Wildlife Corridor is doing is really having an influential effect on our success in conservation." 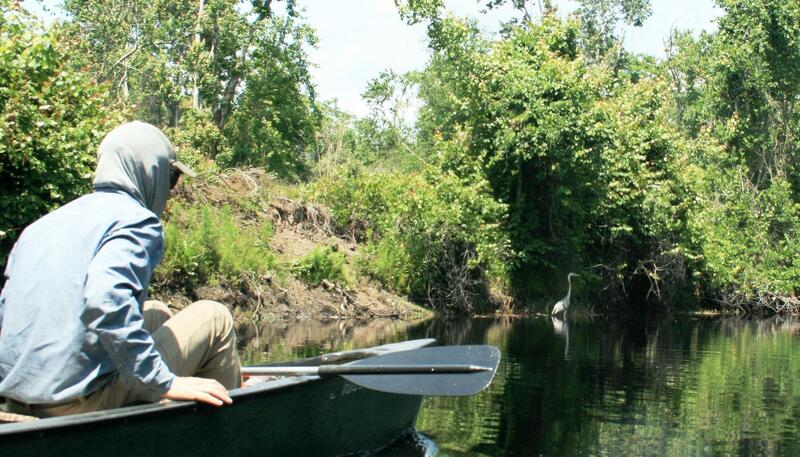 And U.S. Rep. Darren Soto, a Democrat who represents Florida's Ninth Congressional District, credited their work for helping him shuttle a bill through Congress that would declare the Kissimmee River a wild and scenic river - offering more protection against development. He spoke during the event's kickoff at the Disney Wilderness Preserve. "It''s absolutely critical that we highlight - in a way that everybody understands - the importance of these wildlife corridors," Soto said. "They're such an important part of the team to give me the public support to be able to pass some of these major environmental bills like this Wild and Scenic bill for the Kissimmee River." This was the trio's third - and by far the shortest - trek together. The first two were 1,000-miles each. In 2012, they hiked, biked and kayaked the length of the state, from the tip of the Everglades to the Okefenokee Swamp in Georgia. Three years later, they started not far from here - in the headwaters of the northern Everglades watershed - and traveled northwest through the Florida panhandle to the Alabama state line. And after six years of trips, Ward worried during an overnight stop that for some parts of the state, it may already be too late. "Seeing Highway 27 near Lake Louisa State Park here, where you can almost watch the orange groves turning into houses up and down this stretch, we don't have much time to make serious investments in land conservation," he said, "because it's either now or never for some parts of the corridor." Time will soon tell if his prediction becomes reality. It was tough going, but members of the Florida Wildlife Corridor Expedition finished their "mini-trek" over the weekend, traversing a green corridor between Tampa and Orlando. The explorers say they saw the most wildlife once they got past their biggest barrier - Interstate 4. 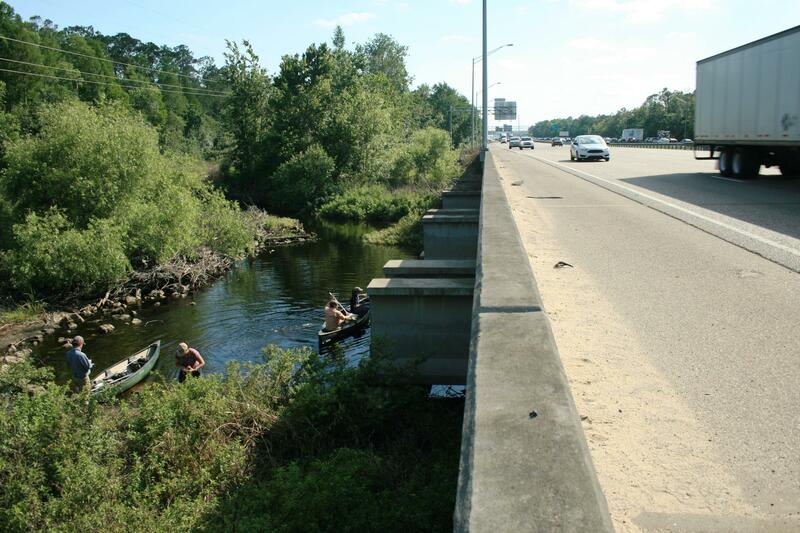 Members of the Florida Wildlife Corridor Expedition emerged from a swamp south of Interstate 4 late Thursday and crossed underneath the busy highway. Members of the Florida Wildlife Corridor Expedition are encountering some rough patches as they try to follow a stretch of preserved land between Orlando and Tampa. They're not expecting to cross their biggest barrier until late Thursday.